Aimed at an Early Years audience (age three to five), Storytime Sundays will take place in a cosy storytime area in Dundee Science Centre from Sunday 18 September 2016 through to the end of January (10am until 2pm). Each story is accompanied by a jam-packed story sack brought to life with props such as animal masks and finger puppets, read by a Science Communicator wearing the special Storytime Science cape. 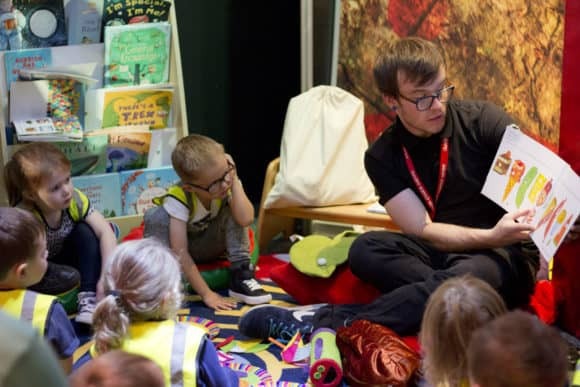 By purchasing a ‘Storytime Sunday Special’, visitors can come along every Sunday until the end of the year, allowing them access to both the Little Building Site, Storytime Sundays and the rest of Dundee Science Centre. The pass costs £6.50 per child aged 4 and above, with under 4s free of charge, adults £8.50 and concessions £7.50.